Trading Pins Made In Days! 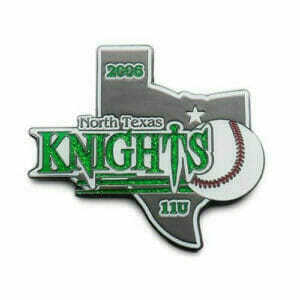 Looking for custom team pins? 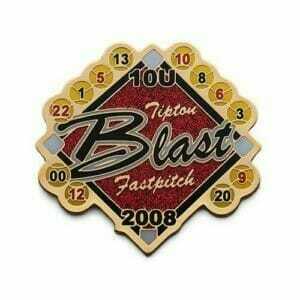 Trading Pins can be designed for Destination Imagination, Baseball, Softball, Soccer, Hockey, Basketball, Cheerleading, Odyssey of the Mind or any other sport or team activity. Sports pins are a great way to acknowledge your team’s accomplishments while also promoting a sense of pride and sportsmanship among players. Ready to start working with the best trading pin company? At the Monterey Company, we make customer satisfaction and pin quality of our foremost priorities. Our friendly and experienced sales team can help you to create truly unique and collectible sports pins with all the most popular accessories. Custom Trading Pins are a memento that will last a lifetime. 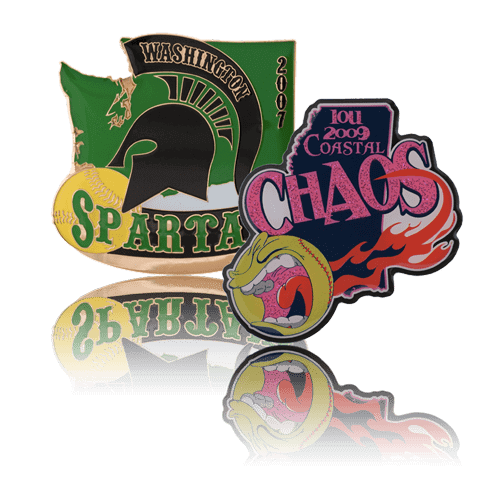 Pin trading has become a very integral part of youth sports, and with our wide selection of sports trading pin styles to choose from, you can create a design that will wow your team. Our passions are amongst the things that define us most. We affiliate ourselves with the things we love and find identity in them. Don’t believe us? 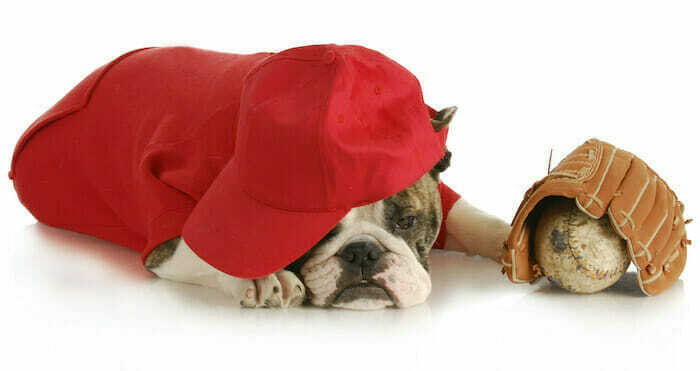 Have a conversation with a sports fan and watch them gush about their team’s biggest victories. Those victories are his victories too. Talk to a former competitor about her Alma Mater's latest loss. She still feels the sting as if it were her own. People take pride in the teams and organizations they support and wear that pride on their sleeves. At the Monterey Company, we make wearing this pride a lot easier by creating custom lapel pins for whatever it is your support. And the best part is- you aren’t limited to pinning them on your sleeves. Customizable in shape, size, dimension, and color, you can create the perfect pin to sit happily on hats, backpacks, jackets, and more. From the moment you reach out to the Monterey Company, we want you to feel like you a found the best pin company. We also want to collaborate with you in creating something of which you can be proud of. Your pins will be unique to you, your interpretation of fandom, of your love of a place, or of your connection to the thing you are commemorating. It will be in the metal you choose, will have the details of customizable dimension, and will be coated in the enamel color that matches the spirit of whatever it is you are trying to capture. We have everything you need to generate the exact design you’re after. How Did Trading Pins Get Started? Although trading pins amongst youth organizations are only growing in relevance by the year, it’s a tradition that’s actually been around for decades. 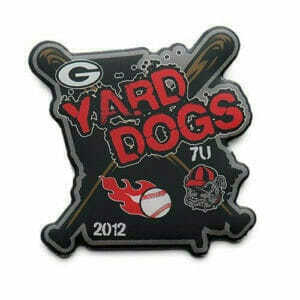 Following the trend started by the World Olympics, Little League Baseball implemented custom pins for their teams in 1983. With each team designing a pin unique to the players and region in which they existed, they created phenomena to be adopted across a multitude of youth sports organizations today. When players began using these pins as an opportunity to connect with members of other teams and organizations by exchanging the pieces designed for them with those of the players and fans from their opposing teams, they forged connections and friendships to be carried with them long after the games ended. This exchange promoted the idea that a sporting event is about so much more than winning or losing, but rather, an opportunity to rally around and find togetherness in love of something. Youth sports, in particular, teach kids that differences, like race, gender, and socio-economic status, are obsolete on the playing field, and that by playing together, we discover we have so much more in common than we realize. And trading pins only perpetuate these lessons. 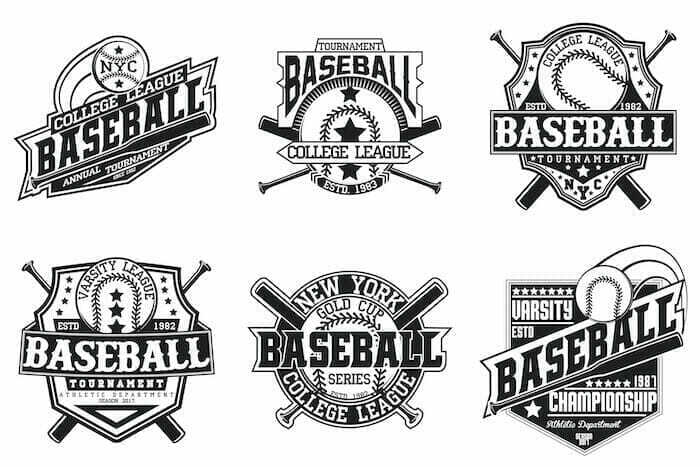 Due to the success in the Little League Baseball organization, custom pins are found in almost any sport in which youth participate today. From hockey leagues to basketball tournaments, and gymnastic competitions to soccer programs, trading pins are forging connections and building friendships one team at a time. Creations bearing your team, club, or organization’s emblem can do so much more than jazz up your attire. They can promote camaraderie through people who support the same things you do, and bridge gaps between fans of opposing teams and organizations. 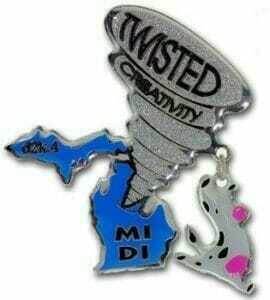 Because some things in life bring us closer together, and custom trading pins are one of the surest examples. Sport trading pins have been popular for many years, with particular seasons, victories, and celebrations commemorated through custom designs. Did your favorite professional team win the championship game? Did your child’s high school track team win their conference meet? Did the local club team celebrate a milestone year of participation? These are a few of many reasons in which our customers purchase our pins; to keep, and to trade amongst friends and pin-enthusiasts alike. We offer a wide array of customizable trading pins so that you and your teammates can create team pins that will impress even the most seasoned pin-traders. Additionally, our cheap trading pin prices will always keep you coming back for more. 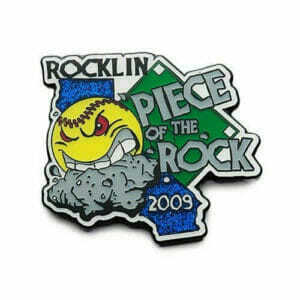 Whether you hope to redesign your sports pins every year or keep the same design for a decade, we can help! You can also purchase your trading lapel pins at wholesale amounts and prices for added savings! Trends in pin trading are extremely dynamic and keeping up with the latest-and-greatest can be exhausting. Not to worry, our specialists are trading pin experts and can guide you through the ordering of your pins. Custom Trading Pins pricing options may vary according to the size and style of your main trading pin. 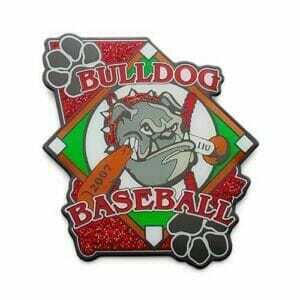 We offer baseball pins, softball pins and basketball pins Our Basketball Pins are especially popular. Let us help you to create an incredibly unique and special keepsake for your basketball team. Optional Accessories Include: Blinking Lights, Glitter, Spinners, Slider, and Dangler Pins Click on the images below for more information. Please allow extra production time for accessories. Trading pins are most common in the realm of sports, with many youth programs encouraging their young sports fans to participate in trading. When you outfit your child with a collection of pieces, you provide them with countless opportunities to make connections. And as their collection expands, with the pins of others growing larger than their signature pins, they learn the value of positive interaction and sharing. This opportunity to cultivate togetherness is why the tradition of trading pins has lasted and will last, for decades to come. Similar to sport trading pins are traveling pins. When we travel, parts of the places, people, and culture we experiences stay with us forever. A lot of these parts are in the lessons we learn from missed road-turn offs, friendly restaurant recommendations, and the unexpected friendships of new acquaintances, but some of these are in the tangible pieces collected by which we choose to remember our travels. How Are Trading Pins Made? Trading pins are made to order and usually include enhancements like glitter, sliders, blinkies, and danglers. We manufacture our pins in the USA and overseas enable offer very competitive pricing. 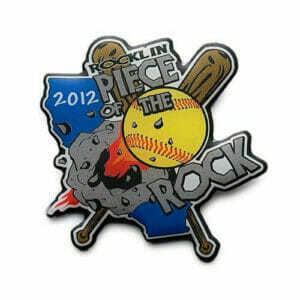 There are two styles of trading pins we offer, soft enamel and a printed pin style. We also offer a stock shaped pin in case you have a rush order and we normally can rush stock shape trading pins in just a few days. 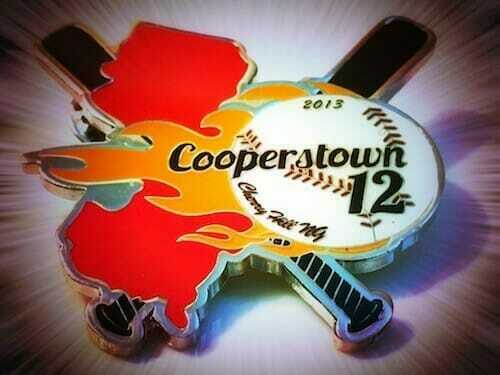 Normal production time is two weeks plus shipping time and the printed pin style is our fastest made pin we offer. Our normal production style can include custom shapes as well as size up to 3"
Printed Pins: This is a great option if you would like to reproduce your design without any limitations. 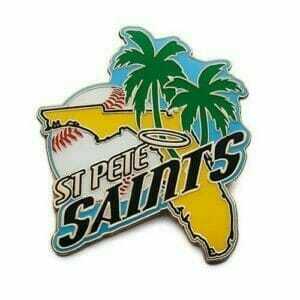 Also, our busy season is May thru July and printed pins can be made faster than any other pin style and we suggest this style if you are short on time. We recommend printed pins as the number one style, followed by soft enamel pins. Soft Enamel Pins: Years ago this was the most popular style pin. Not really sure why but it is an option and these pins are labor intensive but do allow for thinner metal lines separating each enamel color. What you should know about cloisonné pins: This is the only pin style we do not recommend and most of our competitors call there pins cloisonné and that has really driven us crazy! Cloisonné Pins can have a lead content that is unacceptable for kids. Pin Style – Pin traders predominately like to trade etched and printed pins, as they can be made large and brightly colored as well as custom shaped. All this, without ripping your shirt! The thinner base on these two types of trading pins allows us to make a large pin without making your trading pin into an anvil. What Are The Most Popular Sizes? 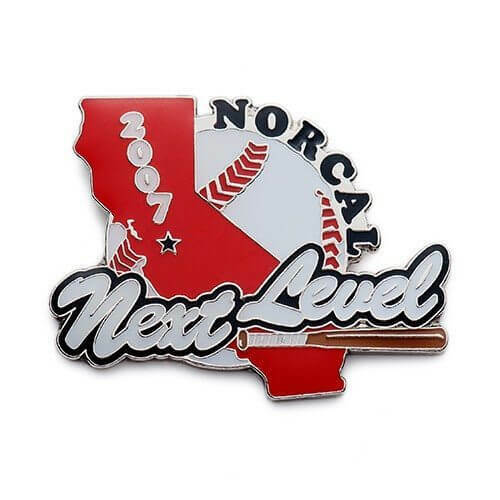 Most players like to trade with other players that have pins that are 1 1/2” to 2 1/2” or larger, but we can design your pin to be virtually any size. How Many Should You Order? We find that most players will trade 20 to 25 pins per game. Be sure to include extras for parents, grandparents, and friends of the family. Accessories – Kids will seek out pins that are the most unique with blinkies, danglers, wiggle heads, sliders, and glitter. One of the cool trends we are seeing with many travelers, particularly in the retirement set, is that many are taking to RV’ing across the country and collecting as many cities and state lapel pins as they can. Of course, there are those that actually travel with the sole purpose of going to a convention or more regional gathering, in order to actually collect and trade with others. Networks are beginning to get created now on the internet so collectors can find each other and tip off their trading colleagues as to what new city and state pins are being released, and when the next event will be. This is a trend that seems to be growing across the United States. This seems to be an outcropping of architectural and historic society pins. Special interest groups gather and commemorate their state and cities within the state for different historical events, special areas of beauty, national parks, and other points of interests. If you are new to trading pins, seek out opportunities to get involved. Pin trading occurs worldwide and amongst a multitude of organizations and locations. If you have something you love, if you are passionate about a place, a team, or an organization, you have everything you need to get started. Contact the Monterey Company and begin your journey in making connections, establishing a friendship, collecting memories, and commemorating all the things that make you, you. It's rare these days to find someone who hasn’t heard of pin collecting and trading. What with massive worldwide societies, like Disney trading pin groups, its become so huge that now there are conferences for lapel pin traders from all over the world, several times each year. 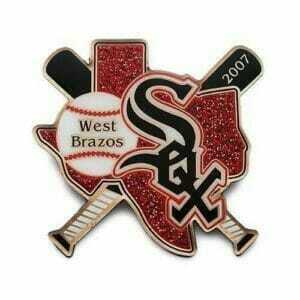 The trend now is for small regional groups to come together based on pin theme interest. These groups make plans to travel to one or several trading shows a year to trade, show and acquire new pins. This concept of creating pins to remember a particular place, country, city, state, park, or landmark is among the newest trend of trading pin-aficionados. Maybe your goal is to collect a pin from each of the 50 states, or from each of the major cities in the European Union. Maybe you want to visit each of the state parks nearest you or to collect a pin for each of the recognized National Monuments. Or maybe you hope to acquire memorial-pieces from historical sites around the world. Whatever your prerogative, the Monterey Company can help. Start with a custom piece of a place that means the world to you. Then, seek opportunities to trade the pieces that are uniquely yours, for the pins of others’ in places that you continue to visit. As your collection grows, the connections you make, and the stories of others that you carry with you become the keepsakes you cherish most. Fortunately, you’ve found the Monterey Company, the place where we take your ideas and your passions seriously. It is no small endeavor to capture the love of an organization or of a place and depict it in a small piece of art. That’s why we’ve spent thirty years assembling a group of people that are up to the task. Our trained and talented staff is dedicated to their craft, and our designers find their inspiration from each of their interactions with our customers. We work intimately with you, combining all of their experience, creativity, and artistry, with impeccable customer service skills, making the design process an unforgettable experience.